Jesus withdrew from Israel and went to the region of Tyre and Sidon. There He met a non-Jewish pagan woman. Crying she pleaded for mercy for her demon possessed daughter. She kneeled before Jesus and respectfully addressed Jesus with the Messianic title, Son of David. When Jesus didn’t respond and she continued pleading, the disciples urged Him to send her away. Jews often insulted Gentiles by calling them dogs insinuating they were wild scavengers. Jesus’ response to this Canaanite woman seemed harsh, “It’s not right to take the children’s bread and throw it to the dogs.” It wasn’t. He was testing her faith. Jesus wasn’t insulting her. He was picturing a family having a meal gathered around a table. The woman understood the metaphor. The children represented Israel. She didn’t see herself as one of the children. She saw herself as the domestic dog who received crumbs that fell from the table. Her intent wasn’t to deprive the people of Israel of their blessing. She wanted Jesus to extend some of the blessings to her and her child. The Jewish leaders rejected Jesus. In contrast, this woman had faith in Him. She had the faith Jesus was looking for in Israel. Jesus granted her request. Her daughter was instantly healed. If a person were to drive by your church early on a Tuesday or late on a Saturday afternoon when no one is in sight, is there anything about the church property that would reach out to that person and make the human connection? Is there anything about a locked church that communicates the message that people congregate there, people who enjoy themselves and enjoy each other; who have a love for life that comes from a true purpose for living? 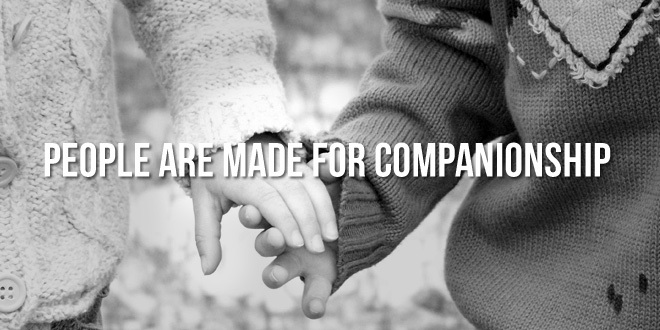 There can be. 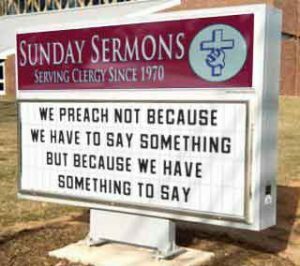 If the church is identified by a sign with a message on it, a message this is creative and relevant, insightful or funny, the thought behind the message can reach out and make that connection. In fact, a well designed, well maintained and creatively used sign can and should be the lens that brings the true human nature of your church into focus.